One of the many low growing species Grevillea lavandulacea has fine foliage and a dense growth habit. The flowers are small, however attractive and appear in large numbers from late winter to spring. 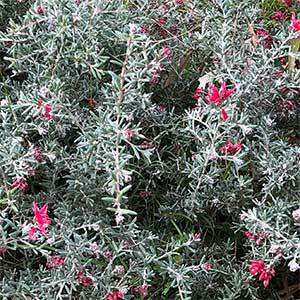 With its dense growth habit and nectar filled flowers it is a great plant to attract small birds into the garden. They can hide in the foliage close to the flowers. Excellent a low border plantain a rock garden or the general garden border. 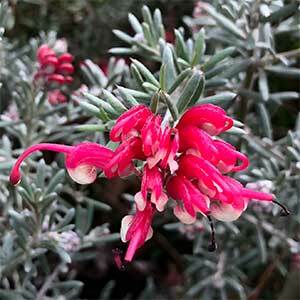 This species is found fron Western Victoria int South Australia, look for the ‘Tanunda’ form which seems to be the best in cultivation, ‘Pinky Pettite’ has paler pink flowers and is also very attractive..
Like most of the genus, Grevillea lavandulacea requires a well drained soil and a sunny position to grow and flower well. It is best grown in a garden bed that has been hilled up a little to improve drainage, this is especially important in heavy clay soils. Being a small growing species, it is also suited to growing in containers. In most soils, little to no fertiliser will be required. In very poor soils, try adding some well rotted compost before planting and then mulch lightly around the plant. A little native plant fertiliser in spring cn be beneficial. Position – Full sun to a little dappled shade. Height – To .4 meter.